The law of multiple proportions asserts that when two elements combine to form more than one compound, the varying weights of one element which combine with a fixed weight of the other element are in a simple ratio. Think of this analogy. Someone taking a walk along a street can have for company one person or two or three or more. But he cannot talk his walk with 0.565 of a person. People just cannot be split and the numbers of people he can walk with must bear a simple ratio to one another, i.e., in this example 1:2:3. Because in chemical reactions atoms can't be split, the same thing applies to elements in chemical combinations with each other. The hydrocarbons can be used to demonstrate this fact. Carbon and hydrogen do not just form one compound, but a large group of compounds known as hydrocarbons. Although the argument applies to all hydrocarbons, it is easier to demonstrate it using only those with 2 carbon atoms per molecule. These are the three gases acetylene (C2H2, also called ethyne), ethene (C2H4), and ethane (C2H6). For every 24 grams of carbon in acetylene there are 2 grams of hydrogen. In ethene, the same amount of carbon requires 4 grams of hydrogen and to make ethane, 6 grams of hydrogen are needed. 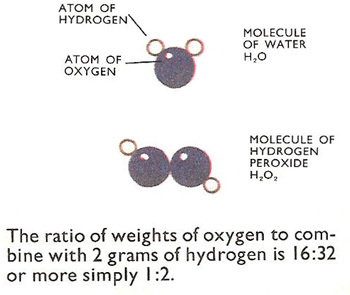 The ratio of weights of hydrogen to combine with a fixed weight (24 grams) of carbon is 2:4:6 or, more simply, 1:2:3. This is a simple ration and the compounds have obeyed the law of multiple proportions. In the hydrocarbon examples, the carbon is taken as having the fixed weight. This is just for convenience with the figures given, but the law still holds good for a fixed weight of hydrogen. If the fixed weight of hydrogen is 1 gram, then the varying amounts of carbon to combine with it in acetylene, ethene, and ethane are 12, 6, and 4 grams. This is a simple ratio of 6:3:2. The same argument applies to inorganic compounds. Hydrogen and oxygen form two compounds, water and hydrogen peroxide (H2O2). 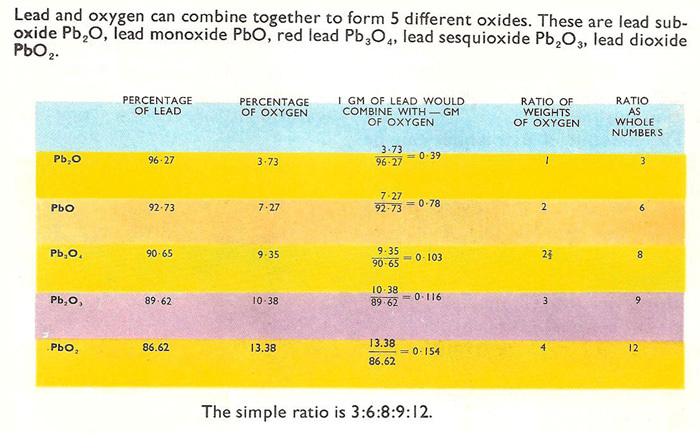 It is obvious at a glance that hydrogen peroxide has twice the oxygen content for the same amount of hydrogen. See also law of constant composition.